Last week I wrote a post on how I have finally found the style I want when I move into my new very small apartment. It's English cottage style decor. If you missed that post you can see it here. 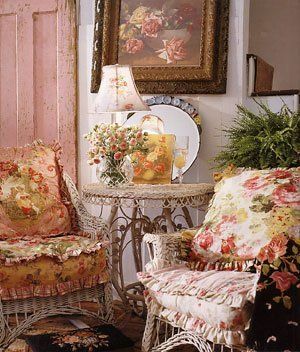 I love the combination of antiques with a comfortable laid back feel. So I have spent my spare moments the last couple of weeks looking for more inspiration. 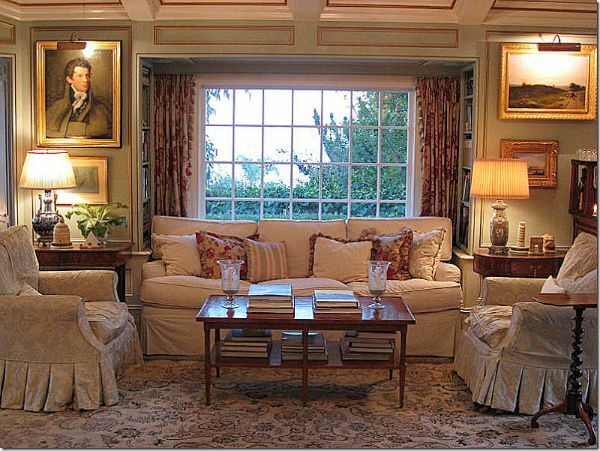 I love the slipcovered sofa and chairs. I think they give the room a very relaxed feel. In fact, I love the whole room.I need a similar sofa in a love seat size. I love all of the vintage needlepoint pillows on this couch. I'm wondering if the two I have survived being in storage. I already have one vintage white wicker chair, so it will definitely be finding a place in my little apartment. I've noticed a lot of plaids and checks mixed in with the florals. I really like the combination. 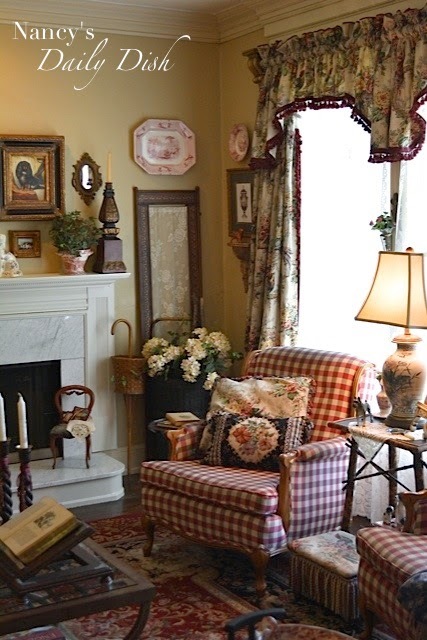 Comfort and coziness seems to be the theme of the English cottage style. As the cooler weather starts to set in I am feeling a real love for all of that coziness. P.S. There is more English cottage decor on my Pinterest board. Thank you, Susie. I love those windows too. I can't wait to get into my own retreat. you've found some great pics of that style. I think you're going to enjoy putting your new home together with that look. It will lend itself well to the cooler weather too. I think I am going to have a lot of fun, Kelly. That is a good solid choice for decor that never really goes out of style, Laura. 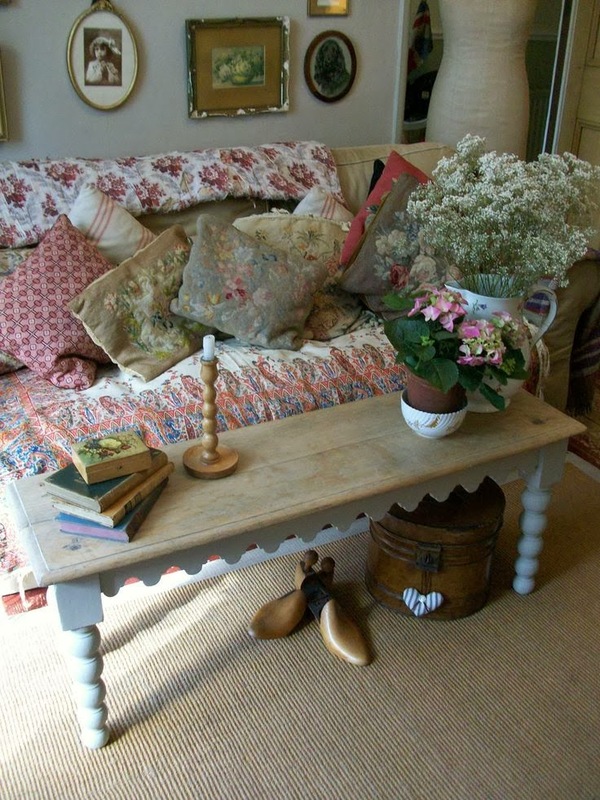 It can be updated easily but having antiques with cottage elements is a favourite of mine. I agree, Pamela. It's always been my favorite too . Oh Laura, what charming photographs! Each one is truly beautiful! I could relax and enjoy life in any of those fabulous rooms! Love that you have chosen Cottage Style!! It's always been my favorite style, Nancy. Great rooms. I could see this in a small area. How soon is the move happening? Waiting for my number to come up, Debby. It sounds like you have the perfect beginnings of English Cottage style waiting for you in storage. The photos are great and so inspiring. I am finding so much inspiration, Gina and I can't wait to get my things out of storage . 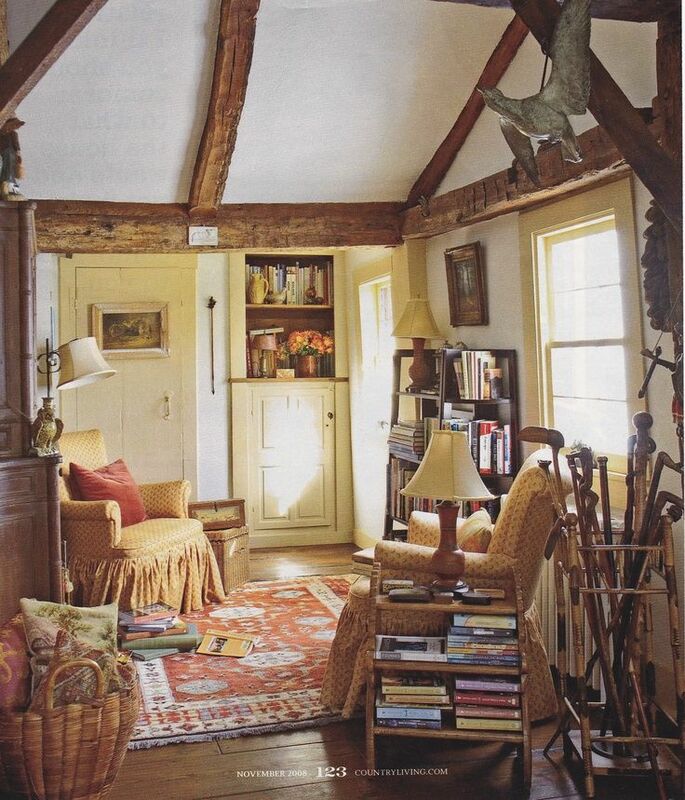 I do like this style and the room in that last photo. That is a cozy one, Michelle. I'm all for comfort and cosy looks, it's beautiful Laura....and with the cooler weather coming up it's going to be even nicer for you to have something cosy like that...build it one piece at a time! I am definitely all about comfort and coziness, Jen. I would be happy to move into any of them too, Linda. Laura you have found some really wonderful inspiration and I Know you will have your apartment looking so cute. Thanks, Kris. I can't wait . I love your inspiration pictures! It's very nice Laura and a look that I could definitely go for. I like how I can imagine actually using everything I have rather than needing to get rid of everything and re-shopping.